A slightly strange salad, that i'm not i'd do again. I think it would be better without the potatoes, but there's lots of flavours in the dressing. - Boil 200g new potatoes, and when cool, thickly slice. - Pound 4 anchovies , then whisk together with 2 tablespoons milk, 2 tablespoons of vinegar and 6 tablespoons of creme fraiche, until smooth. - Slowly add 8 tablespoons olive oil, still whisking, then stir in 1 finely chopped spring onion, 3 tablespoons chopped tarragon and 2 tablespoons chopped parsley. 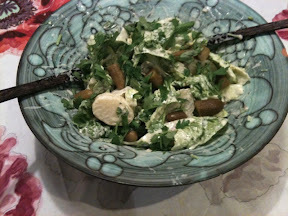 - Season to taste and then add to 4-6 little gem lettuces in a bowl, combining with the potatoes. - Put on a large plate, add 18 cornichons and sprinkle over 2 tablespoons parsley.